Are you looking for a WordPress ecommerce solution? 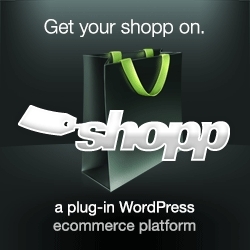 The Shopp Plugin adds a feature filled, customizable online storefront and shopping cart to your WordPress-powered website. It is easy to use for beginners and yet fully flexible for advanced users. It has a multitude of payment gateways and shipping carrier add-ons as well as other add-ons to choose from. Get your WordPress ecommerce solution.